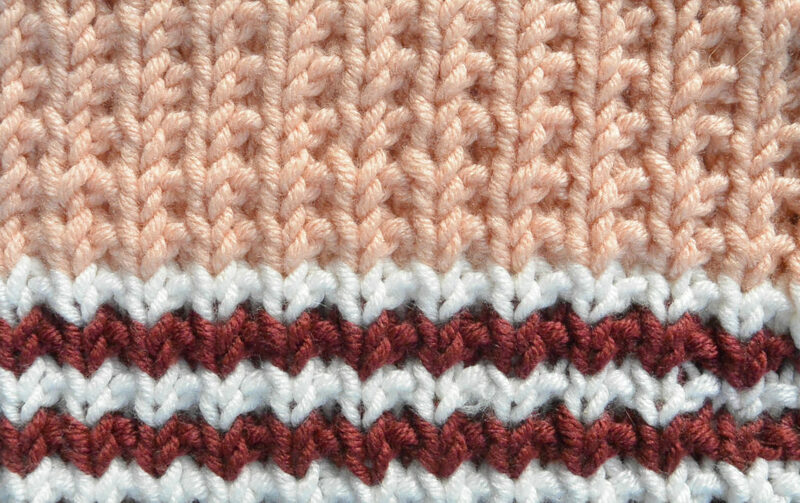 Sometimes you just want a mindless knitting pattern that turns out pretty. I’ve long been a fan of the broken rib stitch, and this chunky yarn was perfect for it! 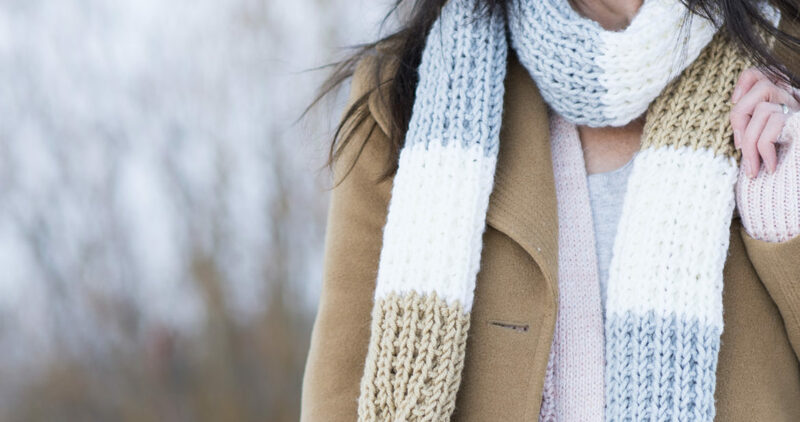 You’ll see that this scarf is really easy to knit but has a lovely texture. It’s a great pattern for beginners who would like to go beyond the basic stockinette and garter stitch, while also practicing color changes. This is the third project that I’ve made with the new Color Made Easy yarn from Lion Brand (you can now find it at select Michaels stores and online at Michaels and Lion Brand’s sites – yay)! With the chill that has taken over the US lately, this scarf can definitely be put to use. It was a balmy 4 degrees yesterday morning here. Brrrr! 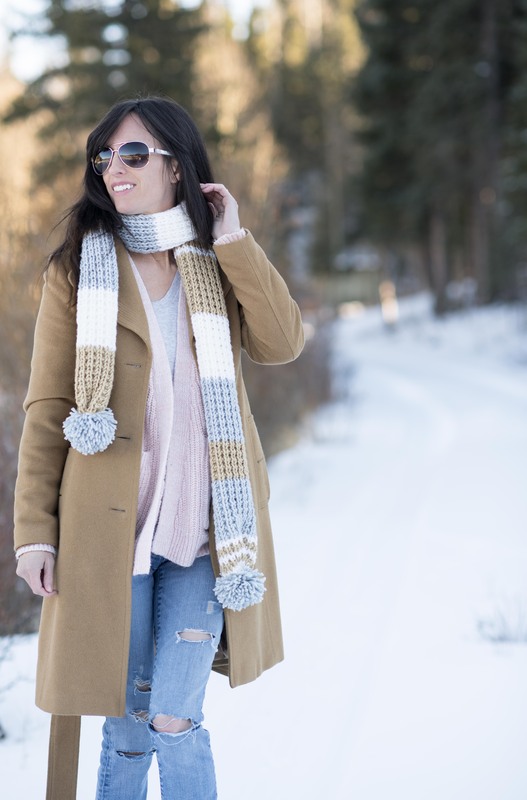 If you like a scarf that is squishy, long and cozy, this could be for you! The poms add a bit of fun to the ends and you can modify the stripes however you’d like. The color possibilities are endless – think school spirit colors, holiday specific colors, and more. It would also work to make it in your favorite sports team colors. I’m sure my husband would like me to make one in blue and orange for the Denver Broncos. Below: I was soooooo cold in these photos. My toes were basically numb and frozen, but my neck was warm! What colors would you use for this striped scarf? It’s amazing the different looks you can achieve depending on your color choices. Below, you can see how this pattern turns out with these other color options. Below: I love this combo for a feminine look. The super popular millennial color contrasts nicely with the pomegranate and white. We thought it would be fun to hang out at the family cabin on this snowy day. It sure was pretty, but we didn’t last long outside in the freezing temps. Are we ready for this pattern?! Pattern Description: This warm, chunky scarf is wonderfully soft and features playful stripes with trendy poms. 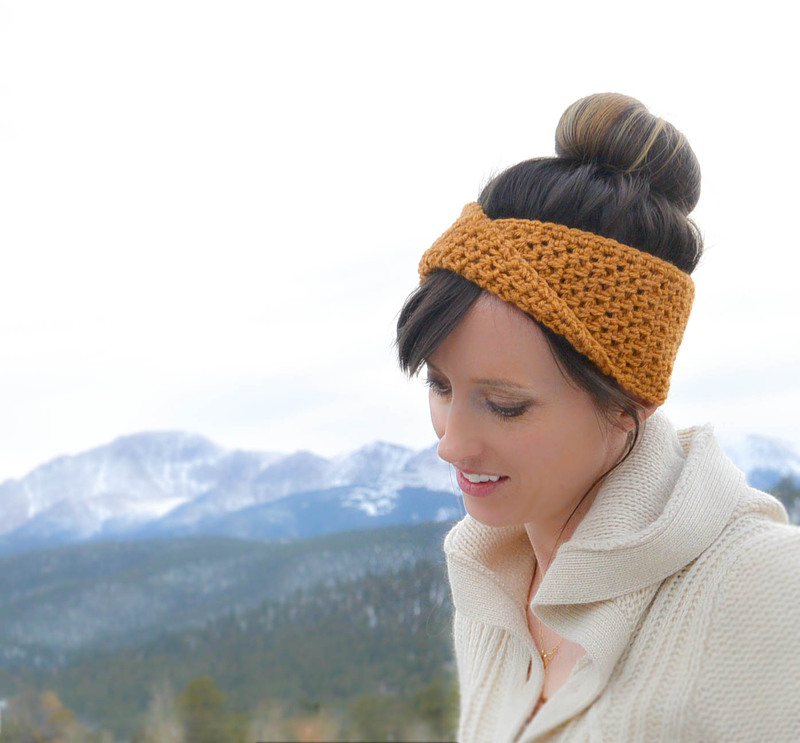 While the stitch definition is stunning, it’s made with simple, beginner knit stitches. 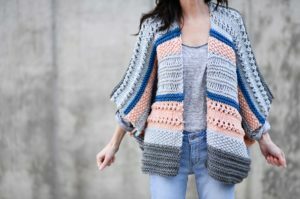 This is a perfect project for new knitters and experienced knitters alike who are looking for a relaxing, on-trend pattern. 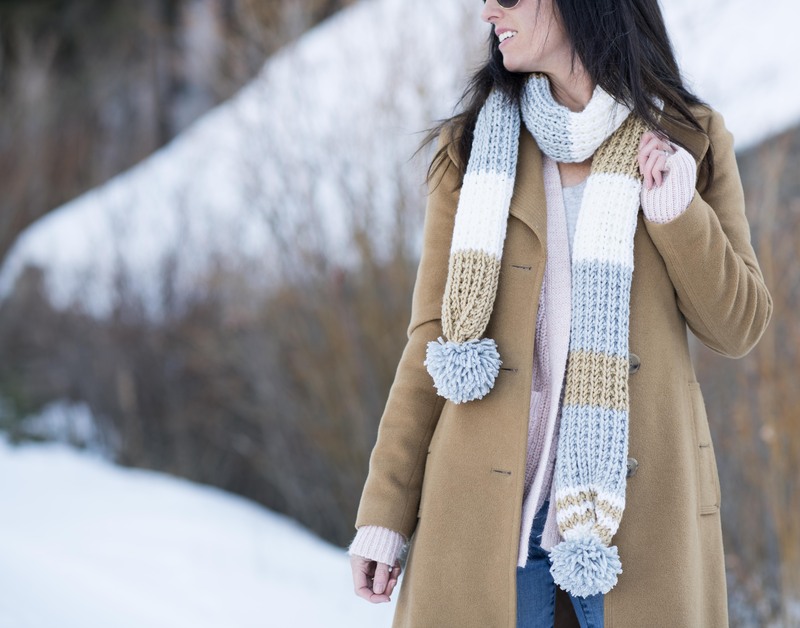 Notes: This scarf is made with a simple stitch pattern using knit and purl stitches. You should be familiar with how to change colors as color changes are made to create stripes. The scarf will curl inward due to the nature of the stitch. 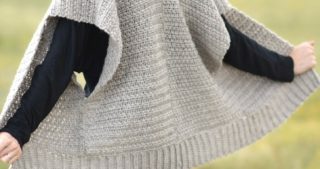 If you’re experienced and would like to modify the pattern so it doesn’t curl as much as shown, you may make a garter stitch border by knitting a few stitches (an even number) at the beginning and end of each row and working the remainder of the stitches as indicated in the pattern. 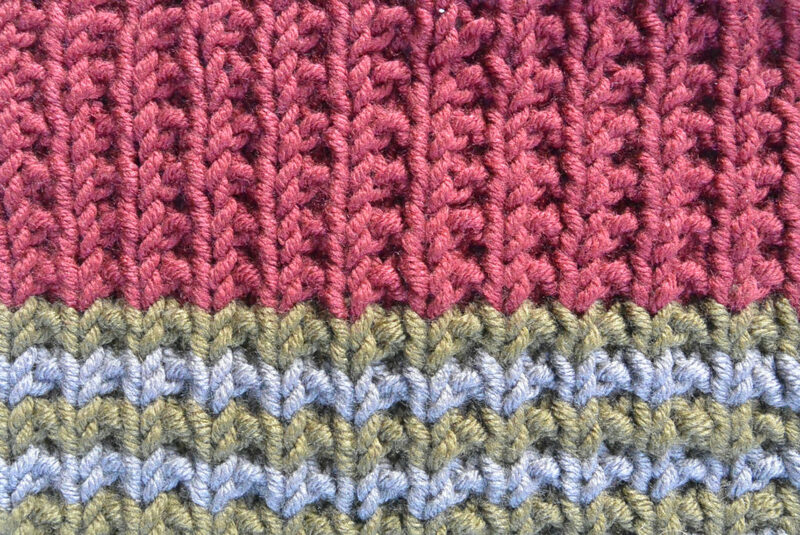 For the remainder of the pattern, repeat rows 1 & 2 using the color indicated for each row. Repeat rows 1 – 84 two more times, using Birch for rows 1 & 2. Use a pom maker or your preferred method to create two large pom-poms ( There are many online tutorials on how to make a pom, including one on the Mama In A Stitch blog at https://www.mamainastitch.com/how-to-make-an-easy-pom-pom-from-yarn/ ). 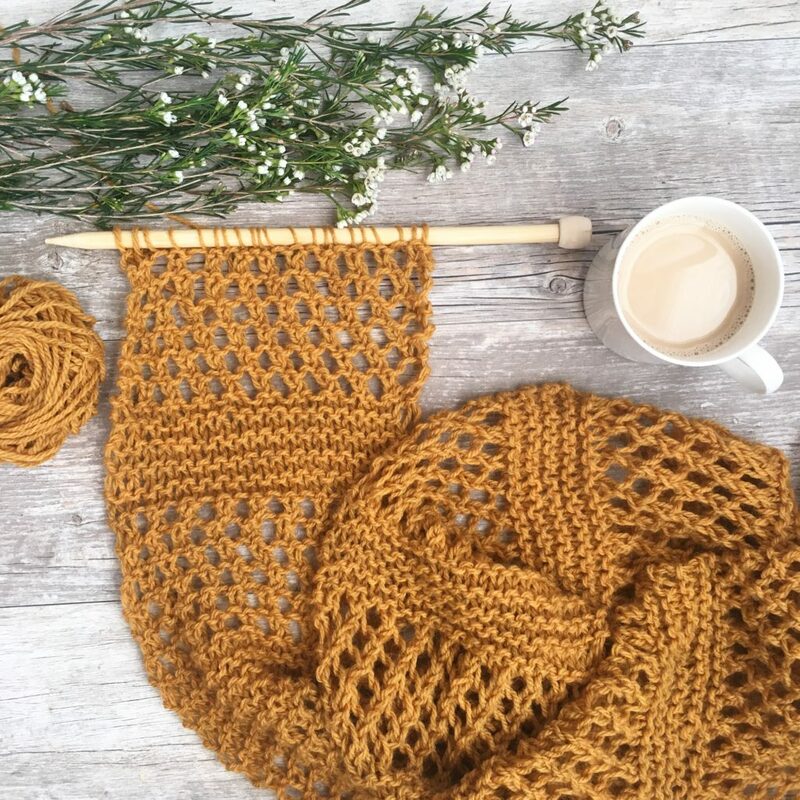 Take the lengths of yarn that will be used to attach the pom, and weave through several stitches on the end of the scarf with your tapestry needle. Cinch the end of the scarf together and tie a knot tightly to securely attach the pom. Repeat this for the opposite end of the scarf. 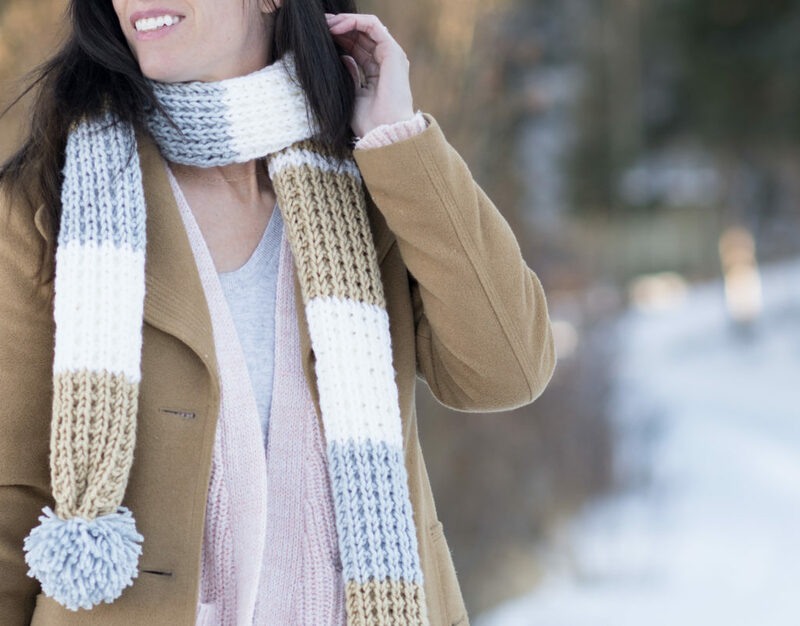 Scarves have long been a beginner knitter’s go-to project as there’s no shaping and you can practice your stitches with ease. 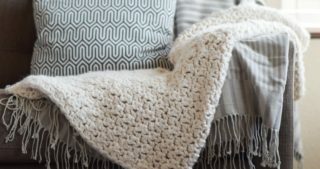 I hope that you find this to be a nice, relaxing project, whether you’re just starting to knit or you’ve been at it for a while. Jessica, how about a hat pattern to go with the scarf!!!! Hi, I love the colors of the scarf. I am ready to try some of these new yarns from Lion Brand. I crochet and really liked the raised ripple stitch you showed. Is this pattern written any where? I learned to crochet a long time ago, before You Tube was even an idea. I taught myself by looking at photos and written instructions. This has always worked best for me. It was a great video though. Oops! I didn’t see that you had already written it out. I’m going to give it a whirl. I don’t know how to knit so I will crochet it in either slip or single crochet . 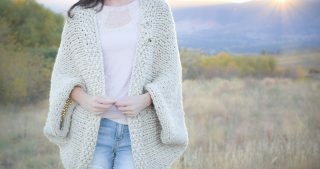 Have you made how to knit video ? Wish we had cold weather ! From the photos, it looked like the “Shade” color was a very pretty light blue, but when I went to buy the yarn at Michael’s, it is really a gray. I just wanted to make sure that your scarf, “in real life,” has gray instead of the blue, right? Or does it seem light blue when a lot of it is knit? (I did not see any light blue colors for Lion Brand in this yarn, though. 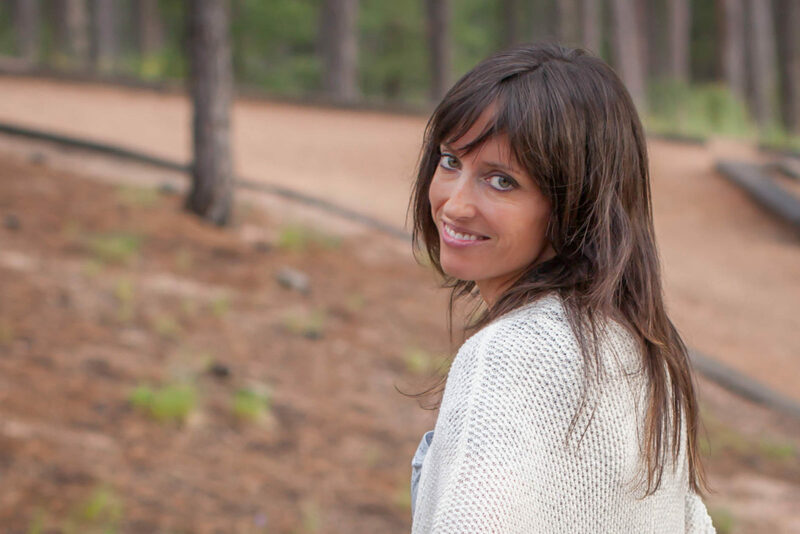 Loved that pale blue with the tan and lighter color!) I ended up buying a navy color, but I am still hankering for the lovely pale blue. Thank you. It is a grey that does even (to me) appear to almost be light blue against these colors. Our screens can also do strange things to colors, but yes, this is a light grey that you see with a light tan and cream. There is a lighter blue called Horizon. It is not as light as Shade appears in these photos, but it goes nicely with the tan and cream colors.